Give a man a ribeye and you can eat in twenty minutes; teach a man to cook a pot roast and dinner will be ready in six to seven hours. 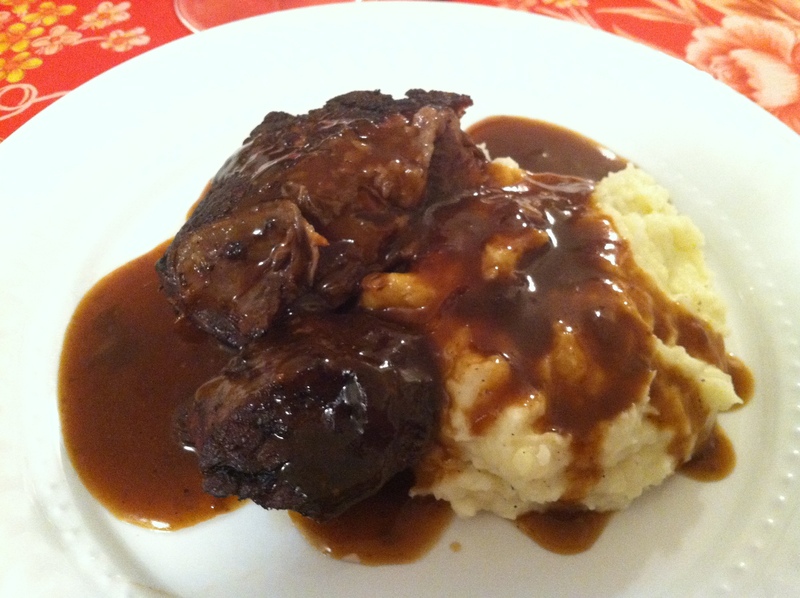 Last week I talked about cooking with ingredients that are scarce and expensive. This week is all about the ingredient that money can’t buy—time. Salad bars and prepped produce in grocery stores can be a convenient time saver. But you will absolutely pay for it. Usually 3-4 times the price of its un-messed-with cousins. “Peasant” food; tough cuts of meat, slow cooking beans, humble, tough grains all take time to prepare. On the other hand, choice cuts of meat and tender, young vegetables only suffer if they stay on the heat too long. Frozen dinners and pre-cooked meals from your local store’s hot bars more expensive by a factor or five. Like my mom says, “Boy, they sure saw you coming”. It may be nice to quickly grab ready-to-eat dinner, and sometimes necessary, but doing it night after night will triple or even quadruple your monthly food budget. It’s all about the time. Like last week, this week’s recipe uses mushrooms; but here the much less costly button-style. 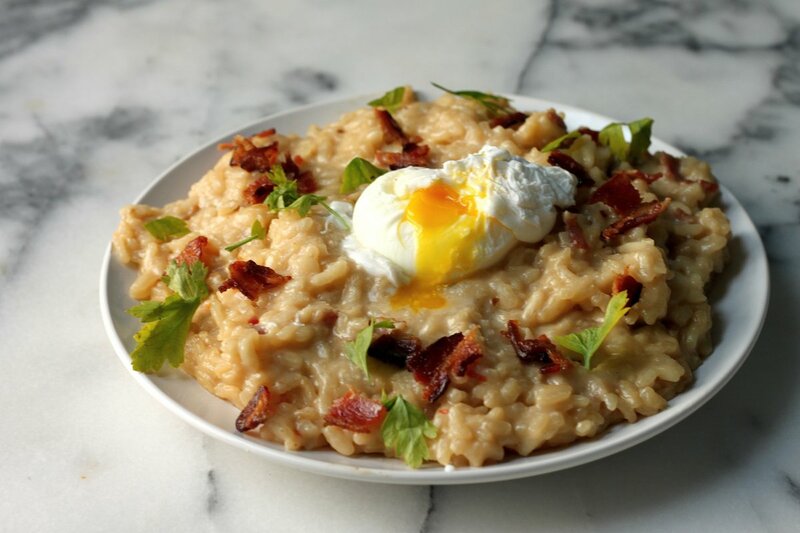 It’s risotto that can be breakfast, lunch or dinner. It’s not fast, and has to be tended. All of the components are relatively cheap and just need flavor to be teased from them. Put bacon into other saucepan, and render on medium-low until it is brown and crispy. Remove from pan and set aside. Pour off the bacon grease until you only have about 1-2 tablespoons in the pot. Add mushrooms and season. Sautee until the moisture has released and cooked out. Add shallot and cook until the veg starts to brown around the edges. Stir in risotto, garlic and one tablespoon butter. Cook until the rice starts to brown just a bit. Pour in Marsala, and cook until it’s completely absorbed. While the wine is cooking out, put a shallow bottom pan on the stove, fill with water, and add vinegar. Turn on medium and bring to very gentle simmer. Constantly stirring, add about 1/2 cup of hot stock to rice pot until the liquid is absorbed, then add more. After about 3 cups stock, start tasting for doneness and seasoning. At this point, start poaching eggs, 3 at a time for about 4 minutes. Remove from water with slotted spoon, and place on a plate covered with a clean kitchen towel to dry. When the rice is cooked through, add peas, butter and cheese. Gently stir until butter is melted. Place about 1 1/2 cups risotto on plate and put 2 poached eggs on top. Garnish with crispy bacon. Serves 3. I won’t try to sugar-coat this for you. It takes a good hour start to finish. But done correctly you will have a trendy restaurant dish that patrons pay big bucks for. Because even though money can’t buy time, some people will still try to charge for it. Thanks for your time. Wow Thank you for sharing this recipe! !